Laurie Cunningham has been in the news recently with four different organisations choosing to remember him. English Heritage announced in February that a blue plaque is to be unveiled at his home in Finsbury Park later this year, and, on the week of what would have been his 60th birthday, Waltham Forest Council launched a joint venture with Leyton Orient FC and Kick It Out to fundraise for a statue of him to be sited at Coronation Gardens. Cunningham'stime at Orient is well documented. The five years he spent at Brisbane Road after he arrived as a gauche teenager and was transformed in to a dazzling young star are rightly credited to the careful management and patient guidance of George Petchey and his assistant Peter Angell. But one other deserves to be given his due for playing his part in nurturing the precocious talent that Cunningham possessed. After being rejected by his local club Arsenal in 1972 and being told he was “not the right material” Cunningham could easily have walked away from the game if it wasn't for a man called Bob Cottingham. Born in Yorkshire in 1922, Cottingham worked as a social worker in Bermondsey, south London, where he established a five-a-side team for the youngsters in his care. Then he moved to north London and worked in Islington where he founded a football team called Highgate North Hill named after the primary school where his son was a pupil. Cottingham was serious about football and attended a residential FA coaching course at Loughborough College in the summer of 1966, the week after England won the World Cup, and was influenced by the great Hungarian side of the 1950s led by Ferenc Puskas, who broke the mould of European football when they thrashed England 6-3 and 7-1 in the space of 12 months. 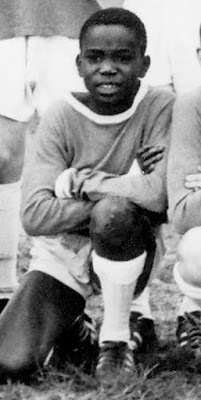 The schoolboy team Cottingham assembled at Highgate was a true reflection of the area where he lived and included Turkish, Greek and Caribbean boys among its squad and they dominated the Regents Park League for years. Cunningham joined in 1967 at the age of 11 and immediately made an impact. His natural athleticism and energy was irrepressible. Cottingham gave him free rein as a marauding winger and built the team around his startling pace. Cunningham became a regular visitor to the Cottingham home in Muswell Hill where he often stayed for meals,joined in family excursions and played football until dusk in the large back garden with family and friends. On match days Cottingham picked him up from Finsbury Park in his camper van, remembering to bring a spare pair of boots or socks for the forgetful youngster, and after matches, it was all back to Muswell Hill for hot dogs and orange squash. The idyllic environment, based around a love of football, must have held a strong appeal to the young Cunningham and was perfect for developing his talent. Then in 1968 Cottingham organised an unusual football tour in Austria that doubled up as a family holiday. Highgate played in a mini-tournament against the youth teams of the national side and Rapid Vienna among others. Twelve boys travelled to Vienna by train and ferry and were billeted with local families. The boys made quite an impact: some had long hair, one was a skinhead with boots and braces and then there was Cunningham sharply dressed, but most startlingly to the conservative Viennese, black. The boys drew attention wherever they went, either playing in the park or on a day trip to the nearby Alps. As interest grew a TV camera crew was despatched to film them and interview Cunningham, who was inevitably the team's top scorer. His photograph appeared on the front page of a daily newspaper as well. When the trip came to an end after two weeks the boys were given a farewell reception at the Town Hall where a buffet was held in their honour by the Lady Mayoress. Cunningham had been the star of the tournament. Back in London, Highgate continued their dominance in league and cup competitions and by the age of 14, Arsenal came calling for Cunningham. But when they rejected him at the age of 16, Cottingham was determined to find another London club that was sympathetic to his mercurial talent. At Orient, after an impressive trial in front of Petchey, he found a nurturing club who were prepared to devote time and energy to his young charge. Peter Angell told the young player that football like chess was a game where brains meant more than anything and you always have time to play while George Petchey assured him that if he carried on the way he was he would play for England one day. The rest, as they say, is history - the sort of history that is now being recognised with a statue and a blue plaque. Different Class: Fashion, Football and Funk – The Story of Laurie Cunningham will be published by Unbound Books. Anyone who makes a pledge can have their name in the front of the book as an Orient fan. Read about Laurie Cunningham's time at Orient in this extract from my book Leyton Orient Greats.